Arya has already read multiple books about Spot over the past month. Since she should be familiar with the cute dog, I thought reading Spot Counts From 1 to 10 by Eric Hill would be a safe choice. Despite being just 12 pages, Spot Counts From 1 to 10 ranks as one of the best baby books I have read to my daughter thus far. Spot Counts From 1 to 10 is far more than just a counting book. Hill introduces animals, colors, and novel vocabulary in just a dozen pages. The book has a picture of Spot and a different type of animal on each page. Whereas a single large cow in cream and brown dominates the first page, ten small bees buzz around Spot on the last page. Spot is consistently cute in different poses. The animals are illustrated in various colors with a unique color scheme on every page. Hill also uses interesting vocabulary with each animal. Chickens are clucking, piglets are squealing, and horses are trotting. Children reading Spot Counts From 1 to 10 will learn ten new words. More importantly, the words are specific to the type of animal and unusual in everyday conversation. Younger children will appreciate the small size and interesting page design of the baby board book version. Arya was eager to play with the sides of the book and flip through the book by herself after we were done reading. 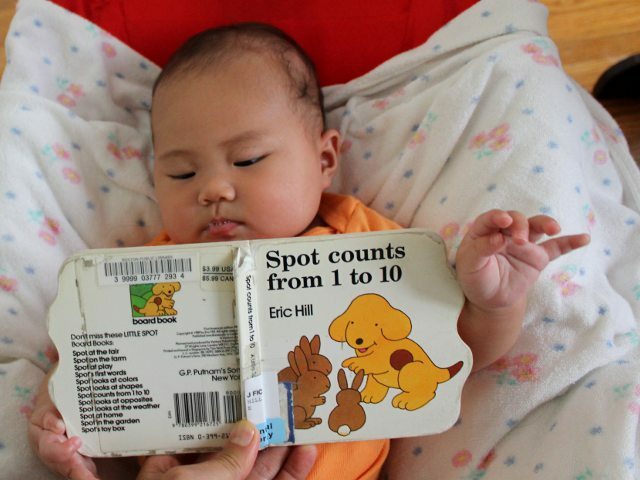 While it is targeted at children aged one and up, Spot Counts From 1 to 10 would be ideal for an older child to read to a younger sibling. The new words, short sentences, and colorful picture provide enough entertainment for kids of a wide age range. Unfortunately the book is currently out of print and hard to find from brick-and-mortar bookstores. Spot Counts From 1 to 10 is still available from Amazon for (including shipping) $12 new and $4 used.